Here we are again in the way-back machine with another volume of G.I. Joe. We have an international incident, the "return" of Cobra Commander, a space adventure and the reveal of the sinister plot behind Cobra's Terror Dromes. These pages are full of Hasbro goodness that's simply jumping off the page. So many new things to promote for the toy line. We also have the first glimpses of Destro's Iron Grenadiers. You can really feel the Cold War influence in these stories. They take me back to the 80's with Ronald Regan and George H.W. Bush. Back before I knew that comics and action figures could ever be worth something; they were simply toys and things to read. My, how the times have changed. Anymore the comics that I purchase from my LCS are brought home in bags & boards, cataloged using Comic Collector Live, bags taped shut and then the issues are added to the growing collection in their respective comic boxes. What a difference a few decades make. 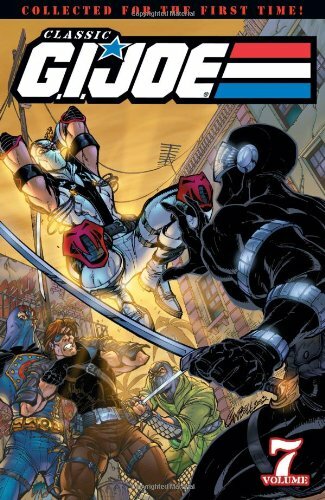 In this trade we also continue the intertwined story that links Storm Shadow with G.I. Joe. I guess that taking a few shots from the Baroness, then used for his DNA to create Serpentor, and almost having his sword ripped-off by the Dreadnoks has soured him on his alliance with Cobra. I guess I'd feel a little pissed if that happened to me and I was left for dead. The inker for several issues in this trade, Randy Emberlin, is one of the best inkers from the 80's and early 90's. I've had several opportunities to meet and speak with him, and I've found he's a great guy as well as a talented artist. I make this a special point because Randy is who inspired me to try my hand at inking, and he was the first autograph I ever entered into my personal collection. Most people don't give credit to inkers, but back before the advent of digital inking, inking was an art form. Add this to your collection and continue to read the series. Can't wait for the next volume.